Bills quarterback Josh Allen will have a new position coach in 2019. The Baltimore Ravens announced Tuesday they have hired David Culley as assistant head coach/receivers/passing coordinator. He replaces former Bills offensive coordinator Greg Roman, who was promoted from assistant head coach and tight ends coach to offensive coordinator with the Ravens after Marty Mornhinweg's departure. "We are very pleased to add David Culley to our staff,” Ravens coach John Harbaugh said in a statement released on the team's website. "He is highly respected throughout the league as a teacher, game-planner and motivator. "As Greg (Roman) and I moved forward with a review and preview of our offense, we both wanted to add the very best coach in this area possible. With David joining us, we have done that. His overall NFL and coaching experience and abilities will help us immensely." 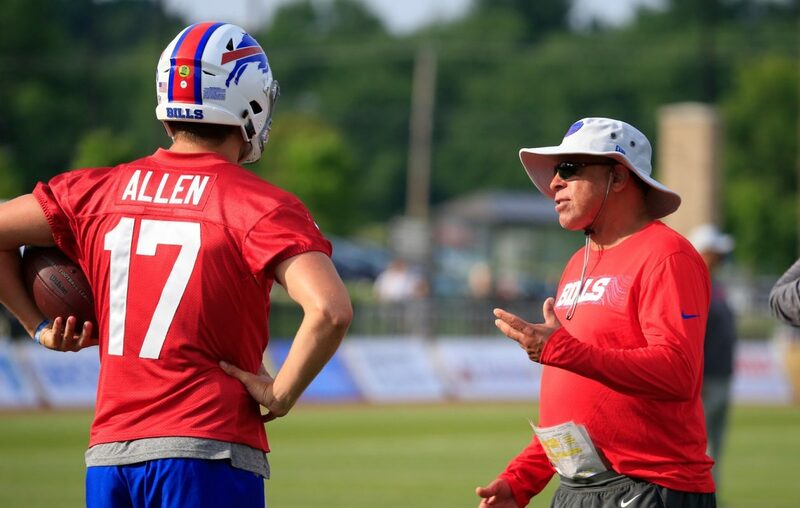 Culley, 63, was still listed on the Bills' website as the team's quarterbacks coach as of Tuesday afternoon, but a league source confirmed to The Buffalo News the obvious: That he's no longer a part of coach Sean McDermott's staff. Culley was with the Bills for two seasons, his first years as a quarterbacks coach after spending his NFL coaching career working with wide receivers. Culley played quarterback at Vanderbilt. "Coaching is coaching, regardless of position," Culley told The News at training camp. "As a receiver coach, basically I've always had to know exactly what everybody does from a quarterback standpoint in the passing game. It's the same thing in the running game. You had to know what everybody does in the running game, because the guys you coach have to be involved." Like McDermott and Harbaugh, Culley worked for Andy Reid with the Philadelphia Eagles. Culley also was assistant head coach and wide receivers coach for Reid with the Kansas City Chiefs. The Bills currently have vacancies for two position coaches: wide receivers and quarterbacks. They also have a new offensive line coach in Bobby Johnson, who has replaced Juan Castillo. The impact the new quarterbacks coach will have on Allen's development makes it an important hire for McDermott and offensive coordinator Brian Daboll, who inherited the offensive coaching staff last year, but has had a chance this offseason to give his input on the staff McDermott is building.